Traveloscopy Travelblog: Nile Cruise: Yabba dahabya do! Nile Cruise: Yabba dahabya do! The dahabya cruise is an innovation whose time has come. Well, actually it's been around since the time of Cleopatra, who once joined Julius Caesar for a nine-month cruise around Egypt. Affairs of state were certainly conducted at some leisure, back then. By the early nineteenth-century, Ottoman pashas and beys were indulging themselves aboard gilded houseboats on the Nile ('dahabiya', also spelt 'dahabya', derives from dahab, the Arabic for gold). European visitors were pleased to follow their example until the steamers and the railways began to offer more expeditious locomotion . The bare-boards felucca journey has become almost a rite of passage with many younger travellers, but the romance of watching the banks of the Nile glide by, drifting at the mercy of the wind and the tide, is tempered somewhat by the necessity to sleep out on deck, by the cramped circumstances and the lack of creature comforts. 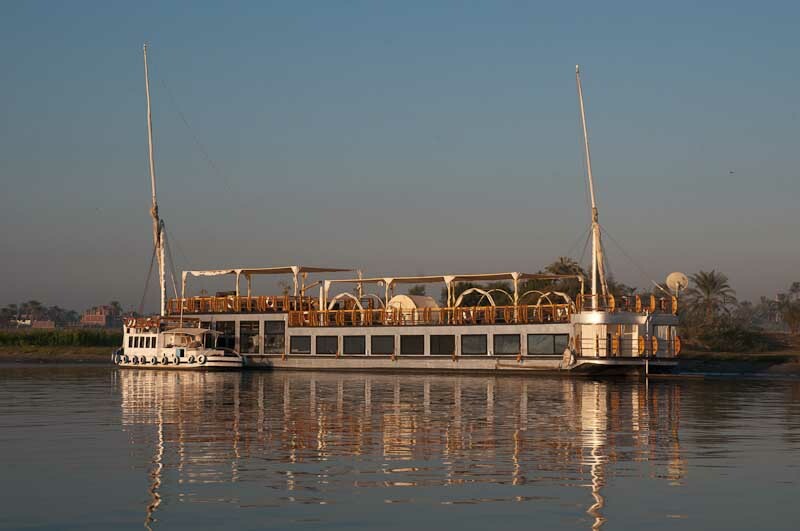 At the other extreme are the huge triple-decker Nile cruisers moored, sometimes three abreast, at Luxor and at Aswan. You'll share your Nile experience with possibly hundreds other passengers aboard what is essentially a floating resort hotel. Shore excursions become an exercise in people-moving. Now the wheel has turned full circle with the advent of the modern dahabya, a twin-masted sailing yacht, typically fitted out in a style recalling a more leisurely era. Aboard a dahabya you savour the romance of journeying under sail on the Nile in the company of perhaps twenty other discerning passengers. You are not cocooned in a package holiday environment, nor rubbing shoulders with half a dozen unwashed strangers. Drinks, laundry and washroom facilities are readily accessible. Welcome aboard the 'Nile Spirit', a purpose-built 47-metre yacht outfitted in a style reminiscent of the Art Deco era: varnished timber, polished brass, picture windows. The vessel's engine operates solely to power the generators; onboard amenities include air-conditioning, telephone, wifi and personal computer. Your fellow passengers number no more than 22, a group intimate enough to comfortably share a single spacious salon and a well-outfitted sundeck with bar. The Nile Spirit features two balcony suites and six spacious 5-star cabins, comprising three King size and three twin bedrooms. Nile Spirit is operated by Lady Egypt Tours, www.dahabya.com, 5 day / 4 night tours depart every Monday from Aswan, and cost 150USD per person per day during summer (low season) and 180USD per person per day during winter (peak season) - all inclusive. Rates negotiable for larger groups. Australian representative: Passport Travel www.travelcentre.com.au ph 03 9500 0444.